Combine seasoning, 2 tablespoons of the oil and pork in a large bowl. Turn pork to coat. Cook pork on a heated oiled grill plate until browned on both sides and just cooked through. Meanwhile, combine remaining oil in a medium bowl with tomato, avocado, cucumber and juice. Season to taste with salt and pepper. 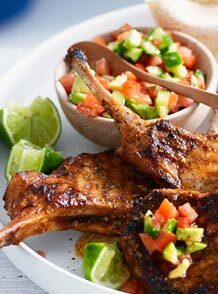 Serve the pork cutlets with avocado salsa, tortillas warmed according to pack instructions, lime wedges and mixed salad leaves, if desired. Studies in young women have shown that those with a low intake of meat, fish and chicken have lower iron stores than those eating meat, fish and chicken more regularly. Could you be low in iron? Around 20% of Australian women of childbearing age are low in iron. Low iron levels may be even more prevalent in young women, with estimates of up to 30% being reported. The symptoms of iron deficiency are subtle and may be mistaken for a ‘busy lifestyle’. They reflect its role in the body. Iron is essential for producing energy from food and contributes to the reduction of tiredness and fatigue. It also carries oxygen to the brain and contributes to normal cognitive function (i.e. ability to concentrate and learn). Furthermore, the immune system depends on iron to work properly. If you have any of these symptoms, you may be low in iron and should see your doctor to have your blood levels checked. What foods are the best sources of iron? Beef and lamb are two of the best sources of well absorbed iron. The Australian Dietary Guidelines recommends having 65g a day of red meat or 130g every second day because it is one of best sources of iron and zinc in the Australian diet. Haem-iron, which is well absorbed by the body and only found in beef, lamb, pork, chicken and fish. The redder the meat, the higher the amount of haem iron. Non-haem iron, which is less well absorbed by the body. Plant-based foods such as iron-fortified breakfast cereals, dark green leafy vegetables, wholemeal pasta and bread, legumes, eggs and nuts contain only non-haem iron. Try to include foods high in iron at meals. Eat beef and lamb 3-4 times a week; otherwise include plenty of other iron-rich foods every day. Maximise iron absorption from plant based foods such as breakfast cereal, legumes, nuts and spinach by combining them with either vitamin C-rich foods (e.g. oranges, strawberries, tomatoes) or foods containing haem iron (e.g. beef or lamb). Avoid drinking tea, coffee and cola drinks with your meals. Instead, enjoy these drinks between meals. Copyright © 2013 Goodchild Meats.